MTA Singapore is a 4 day event being held from 4th April to the 7th April 2017 at the Singapore EXPO Convention and Exhibition Centre in Singapore. The exhibition showcases a spectrum of innovative technology, including additive manufacturing (also known as 3D printing), optics and photonics, precision engineering and semiconductor manufacturing. 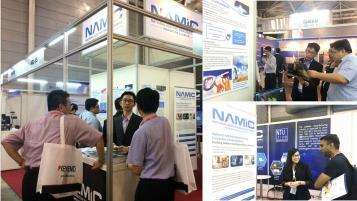 NAMIC CLP, with the support from the hubs of NAMIC@NTU, NAMIC@NUS and NAMIC SUTD, took part in the exhibition with many industries. The event also conducts conference programs in the Plant, Machinery & Equipment industry.